This 3-slot tool organizer is the perfect way to straighten up your broom closet, garage or tool shed. This is the small size. We also offer a 5 slot version here: 5 Tool Magic Holder. This tool holder and storage device will accomodate up to three large tools, and is incredibly easy to install and use. Your mops and brooms will be neatly organized and stored off the ground which will cause them to last longer and be easier to find when you need them. It can be mounted virtually anywhere, so you have the ability to organize your broom closet, utility room, office, garage, shed or any where else. It is specially designed to hold virtually any tool with a handle, and thanks to the clever design, it automatically adjusts for size in order to grip quickly, and hold your tools tight. 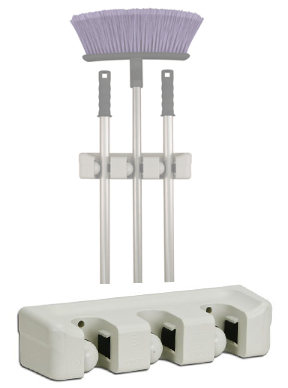 In the house you can use The 3 Tool Magic Holder for mops, brooms, dusters and more. Take it outside and use it for your shovels, rakes and other gardening tools. Mount this great device in your garage, and it becomes the perfect way to store sports equipment too. It will hold baseball bats, golf clubs, tennis rackets and just about anything else with a handle. This is a great space saver, and the perfect way to store and organize all of your long handled items with ease. The 3 Tool Magic Holder features a unique magic ball design that automatically adjusts and tightens to the thickness of the handle inserted. The strong, non-slip rubber pads and rings will securely hold any type of handle in place until you remove it. It works on any material with a width of 0.75" - 1.375" thick. If you are like most people, you are probably tripping over a jumbled pile of tools every time you go to get one. Many of us use the closet door as an organizational system, but nothing beats actual organization when it comes to the broom closet or other tool storage locations. When you just toss tools anywhere, or leave them in messy piles, it can lead to damage, and will most likely decrease the life span. Take two minutes to mount this storage rack on the wall of your garage, or inside the door of your broom closet, and you can kiss those messy nightmares goodbye. It will make everything neat and tidy, elevate it off the ground, and leave your tools incredibly organized so it is easy to find one when you need it. The end result will be a cleaner closet, and better functioning tools that last longer. You will eliminate clutter, and also prevent things like flattened bristles or misshapen heads because no tool will be resting on the ground or buried by another. This versatile storage rack is perfect for mops, brooms, vacuum pipes, dust pans, gardening equipment, sports equipment, large tools and more. Basically if it fits in the slot, the Magic Holder will hold it. Simply mount it to any wall using the included hardware and it is ready for use. This tool holder is easy to use and offers space enough for up to three large tools. It will provide a simple and secure way to hang tools and keep them organized. It is designed to automatically adjust to any handle size in order to deliver the perfect amount of pressure to keep tools securely in place. Simply place any tool or other object into the slot and let it fall to hang it. This rack works with anything that will fit, and instantly grabs hold, no matter the weight or material inserted. The downward pressure of your hanging handle is what makes the mechanism grip, so it will be nearly impossible for any tool to fall out. They will be held tightly in place until you need to use them. Yank downward, or pull straight out and the broom or mop will not budge. Lift up slightly with one hand, and then out, and the tool will slip free quickly and easily. No amount of downward or direct outward pressure will cause the tool to release, but simply lifting up and out will allow you to remove the tool with ease. Order Yours Today! Dimensions 3" x 12" x 4"
3 Tool Magic Holder - An easy way to keep all of your tools organized. Easily hang or remove virtually any cleaning tool with a pole, baseball bats, tennis rackets and more. Works as described but the holders should be farther apart and moveable. This is a well made product. It works well, takes up little space and allows more tools in less area. You have to teach yourself to lift, then remove your broom. This is so much better than a dozen nails in the wall! Great item, fair price. Thanks! good product...does what it's supposed to do. Only regret is not getting the longer model. Appreciate the quick delivery! We really love this holder ~ It does exactly what it is supposed to do which is to hold mops and brooms up off the floor. Just grasp and lift slightly to release the broom or mop from the holder. We have never had anything to fall from this holder without assistance.' It was well packaged, and came in exactly as expected. I will do business with this company again! What is the part number for 3 Tool Magic Holder?